Description: This set includes a small orange and yellow fork lift, a pallet, crate, and an Original Little People construction worker. The fork lift has "spring-loaded action" with a fork on the front that moves up and down. The tireless construction worker (green or light blue body) wears a crome-like construction helmet. Eventhough the pallet and crate used in this set were used in other Little People sets, they are still usually the first pieces to get lost, thus the most hard to find pieces in this set. 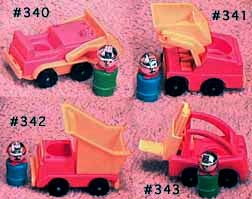 This set was also sold in #398 Fisher-Price Little Trucks Assortment along with three other construction vehicle and worker sets. The #343 Fork Lift is the only one of the four sets that was sold with more than 2 pieces (the vehicle and construction worker). In addition, the other vehicles sold in the #398 assortment were carried on in 1985's #2352 Little People Construction Set, but the fork lift was never used again in the Original Little People line after 1984. FPT269 - Brown square simulated wooden plastic shipping pallet that has 2 edges on the bottom sides to allow the fork on a fork lift to slide under the pallet and lift it. The top of the pallet holds a crate and it has an edge to prevent the crate from sliding off. FPT262 - Square greyish-tan plastic "wood-slat" sided crate with 5 horizontal "wood boards" on each side and a "wood board" on all 4 edges of each side. Has a diagonal mold seam across the top and bottom. Measures 1-1/8" wide, 1-1/8" deep, 1-1/4" tall. BVPP - Green construction worker with a silver construction helmet, orange scarf, and no moustache. *See "Variations" below. UPP - This set could have also used a light blue construction worker with a moustache wearing a silver construction helmet and an orange scarf.